7’ Billiards | Pool Tables are sized smaller than professional regulations for private usage in tighter spaces such as bars and small homes. 7’ Tables have playing surfaces measuring 78” | 198 cm in length, a width of 39” | 99 cm, and have beds set at 29 1/4”-31” | 74.3-78.7 cm from the floor. A standard 7’ Pool Table has an overall size of 93” x 54” | 236 x 137 cm and a height of 32” | 81.3 cm. 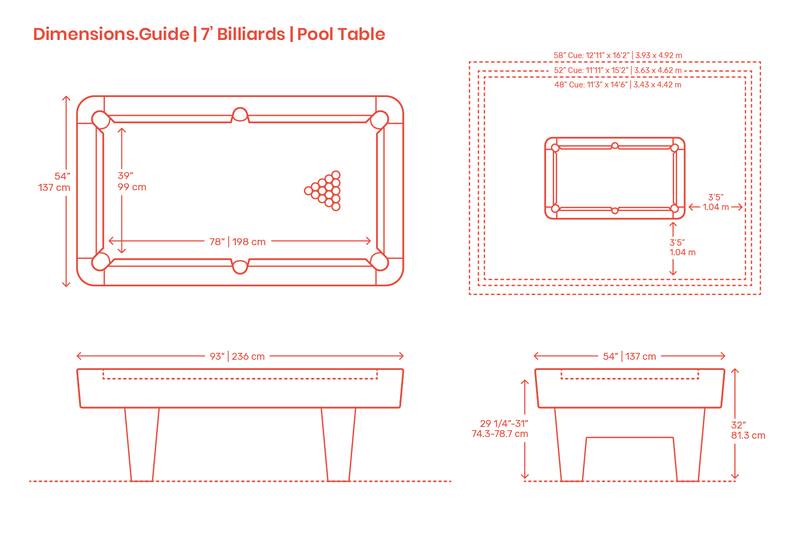 A clearance space of at least 11’3” x 14’6” | 3.42 x 4.42 m should be provided for a 7’ Billiards | Pool Table.